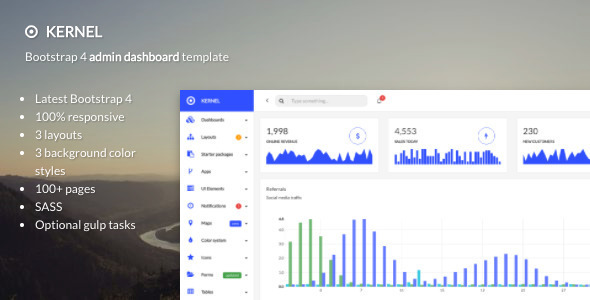 Kernel is an advanced, responsive dashboard UI kit built using Bootstrap 4 and jQuery. It includes 3 different layouts, 3 background color styles, more than 100 HTML files in every layout and lots of widgets and custom made reusable components to help you develop your next application. Kernel is 100% ready to use and easy to customize. It runs using Gulp or with any development server, with no configuration required. It also comes with optional Gulp tasks for a faster and improved development experience. Copyright 2017. This site wouldn't exist if it wasn't for the awesomeness of the Twitter Bootstrap front-end framework.